Does my friend plan to dye her hair when the time is ‘right’? She doesn’t yet have any grey hairs, and is a year older than me. Yes, she most definitely will be dying it, she tells me. But she doesn’t think she’ll have to start dying it for a while: her mother remained a brunette into her early 40s. My own mother, on the other hand, has dark hair like me, and has been colouring her hair to cover the grey since her early 40s. We have had several conversations during which she has expressed a desire to be released from the shackles of continued dying, but feels she cannot ‘go grey’ now; any radical change in her hair colour would – she imagines – make her look like an old hag. I found the disparity between my friend’s attitude and my own quite shocking. Going grey is something that happens to all of us, an inevitable part of the ageing process. Many of us start to go grey in our late 20s or early 30s. Some of us decide to dye our hair, thereby covering our grey. Others don’t bother starting. For those of us who have dyed our hair for other reasons – maybe we don’t like our natural hair colour – it is simply a case of carrying on. But for others, like me, who haven’t dyed their hair since their early 20s, it requires an active decision either way. I naively assumed that most women my age would prefer to go grey than commit to dying their hair for the next 30 years. There are hard-headed, practical reasons for this. For one thing, dying your hair can be hideously expensive. Ubiquitous high street salon chain Toni and Guy, for example, charges anything up to £55 for a root touch-up, which will be on top of the price you pay for a cut and blow-dry. Although the cost of dying your hair can be mitigated somewhat these days by the increased efficacy of home hair tint and root touch-up kits, if you want it done professionally, in a salon, you have to cough up big-time. Financial and temporal implications aside, there is at least one other pertinent reason to abstain: tinting can be bad for you and your hair. Because of its chemical content, sustained use of mainstream dye can result in hair becoming brittle, discoloured and dry. Moreover, in a Guardian article last year, beauty columnist Sali Hughes highlighted growing concerns over the purported link between hair dye and anaphylactic shock, a potentially fatal allergic reaction to environmental stimuli. Hughes, who herself suffered a near-fatal anaphylactic shock within minutes of having had her hair coloured professionally at a salon, reported on two recent cases of severe anaphylaxis brought on by use of home hair colourants, one of which was fatal. The chemical thought to be responsible is p-Phenylenediamine, or PDD, an organic compound used in virtually all hair dyes. If it is so manifestly disadvantageous, as would appear to be the case, why do we go to such great lengths to cover our grey? According to the friend I mentioned earlier, if you don’t conceal your grey hair, it can make you look prematurely old; the face won’t fit the follicles. Going grey, it would seem, makes us appear more professional, another prima facie pragmatic reason to allow nature to take its course. In addition, women who choose not to dye their hair are perceived, according to my friend, as “lazy old hippies”. Another friend, a university lecturer who has just turned 30, agrees that women who opt to go grey can be seen in a less that positive light. In her view, there is a general attitude that not dying your hair is tantamount to “letting yourself go”, especially if it’s long. She highlights the “nasty, hateful bile” that has recently been directed at Mary Beard, professor of classics at the University of Cambridge, as a topical example. Journalist Samantha Brick, who recently gained notoriety by claiming that women hate her because she is attractive, accused Beard of being “too ugly for television”. Brick was agreeing with Times columnist A A Gill, who claimed that Beard’s looks are a “disaster”. Both Brick and Gill single out Beard’s long, wavy grey hair for special abuse. There is something paradoxical here. On the one hand, if a woman wants to be taken seriously at work, she should keep her hair grey: age denotes experience. On the other, if she wants to avoid being deemed a lazy old hippy who has let herself go, she must actively cover her grey. Either way, a woman is under pressure to modify her appearance according to society’s demands. If she opts to dye, she risks not being taken seriously; if she elects to go grey, she risks being insulted. All this feels depressingly familiar, yet another example of a woman being judged according to her appearance and not how clever she is or how good she is at her job. As for me, I’d better get used to being called a lazy old hippie. 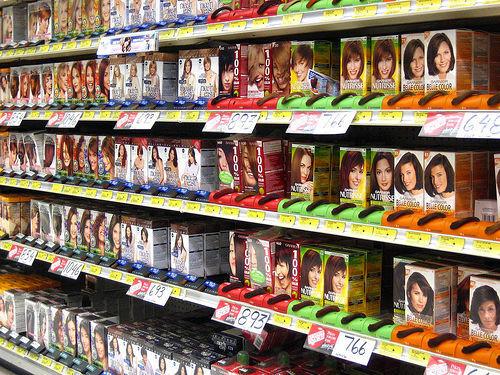 First picture of shelves of hair dye in a shop, uploaded by Flickr user hfabulous. Second picture of a sign for a hairdresser, reading “Angelo Coiffeur Pour Dame” uploaded by Flickr user minipixel. Third picture of a grey-haired woman uploaded by Flickr user Edwin M Escobar. Almost exactly a year ago I realised I’d been dying my hair for so long to hide the grey that I didn’t know what colour it was, so I stopped and so started the questions, the puzzled looks, the surprise and affirmations that I would look 10 years older. When I explained that I was quite relaxed about the colour of my hair and if I wasn’t bothered then why were they, it became clear they believed that meant I was ‘letting myself go’. No, I said, just not dying my hair any more and don’t think it’s a big deal. I’ve had a few greys here and there since I was 18 or 19, and that was quite distressing when I felt that I was only just becoming an adult and already starting to look old! I’m now 27 and still have a few greys, which are slowly increasing. I don’t really care if I can’t see them, but if I notice one I will pull it out. I’ve got very dark hair and the grey hairs do tend to stand out. I have no problem with going completely grey, but I wouldn’t be happy about it if it happened tomorrow. When I dye my hair (which is quite infrequently) I use henna which doesn’t totally hide greys, but sort of tones them down and makes them blend better into the rest of my hair. I dye mine, and would sooner not be bothered with it, the cost, the chore of doing it, the chemicals etc. I don’t even really care if it makes me look older, personally. What does bother me though, is whether my daughter will have a problem when her friends think her Mum is her Grandma, (I’m an older mum). So for the time being I’m keeping it up, for her. I have been home dying my hair for 20 years now. Not because I want to cover the grey, but because I wanted my hair to be a different shade to the one it is naturally. I use my hair colur as an addition to my wardrobe – an important part of my identity. I love the grey/white hairs I have… just not the naturally bland colour the rest of my hair is! I suspect that, when enough white hairs start to show through in the regrowth, I could be tempted to go for lighter shades again to ease the transition. I’m hoping for a beautiful head of white hair like my grandma had.